Cowboy Steak recipe featuring a smokey coffee rubbed steak! Plus, an easy oven roasted Brussels sprouts side dish that cooks while the steak cooks. Such an easy romantic dinner for two! Whole30 compliant, too! OH, HI. I’m alive. Yes, please, and thank you. I’m home from New York, and still recovering a bit. I severely underestimated the exhaustion I would face being 7 months pregnant while running to and from meetings and cabs for 3 solid days in New York. Nevertheless, I had an absolute BLAST, and I can’t wait to tell you all about it in a ‘Checking In‘ post this weekend. Let’s take a mini break from desserts, ok? It’s bloody cold outside and we all need comfort food. I’ll be bringing you weeks of comforting Dinners for Two! And maybe some warm, hearty breakfasts for two to get you geared up for snow shoveling. Sound good? If you miss the small desserts, you can always buy my book. (That is officially the most shameless plug I’ve ever done in my life. Sorry. One of the brands I’m working with this year is Omaha Steaks. I really appreciate that you guys let me work with brands to help ‘keep the lights on’ around this place. In the blogging world, ad revenue fluctuates. Working with brands under contract is guaranteed income for me. So, that’s why I do it. But, believe me, I only work with brands that sell wholesome, raw ingredients that I feel good about putting in my body. 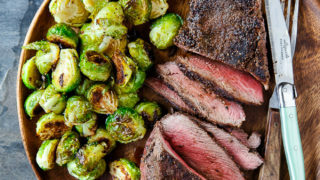 I created this recipe for Cowboy Steak with Brussels Sprouts for Omaha Steaks, and I know you’ll love them. The steaks have an easy rub featuring coffee to make them extra smoky. And since it’s way too cold to grill, we’re going to employ our trusty cast iron skillet. I want your eyes to be free to watch the steaks cook, so I made sure the sprouts were easy and hands-free. After a quick toss in olive oil and steak seasoning, they go into the oven to roast to perfection. You don’t even have to check on them–just focus on getting that perfect medium-rare on your steak. Or, rare. Or, well-done—however you love your steak, really! If Brussels sprouts aren’t your bag, substitute any vegetable you like. One weird thing I learned when testing this recipe is that the larger the sheet pan you use, the faster the vegetables will cook. Keep that in mind. I use mini quarter-sheet pans, but the most common sheet pan you’ll find is a half-sheet pan. Give the vegetables a quick peek in the last 3 minutes of cooking to be safe. Cowboy steak recipe with coffee rub, plus easy oven roasted Brussels sprouts for two. 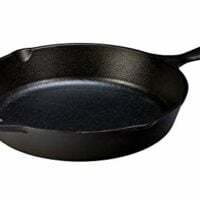 First, preheat a 10-inch cast iron skillet over high heat. Once the pan is hot enough that you can only hold your hand a few inches from the surface for a few seconds, turn the heat down to the medium. Meanwhile, combine the coffee grounds, salt, pepper, garlic and onion powders. Rub this mixture very generously on the steaks, including the sides. Once the pan is hot and the heat has been turned down to medium, add the vegetable oil to the pan. Carefully tilt the pan to coat it evenly. Add the steaks and do not move them for at least 5 minutes. Have a meat thermometer handy. After 5 minutes, flip the steaks. Depending on how you like your steaks, cook them another 4-9 minutes. I used a meat thermometer to ensure 140-degrees for medium. When the steaks are 5-degrees below your ideal range, remove them from the pan and wrap in foil. Let rest for 10 minutes before serving. Meanwhile, preheat the oven to 400-degrees. 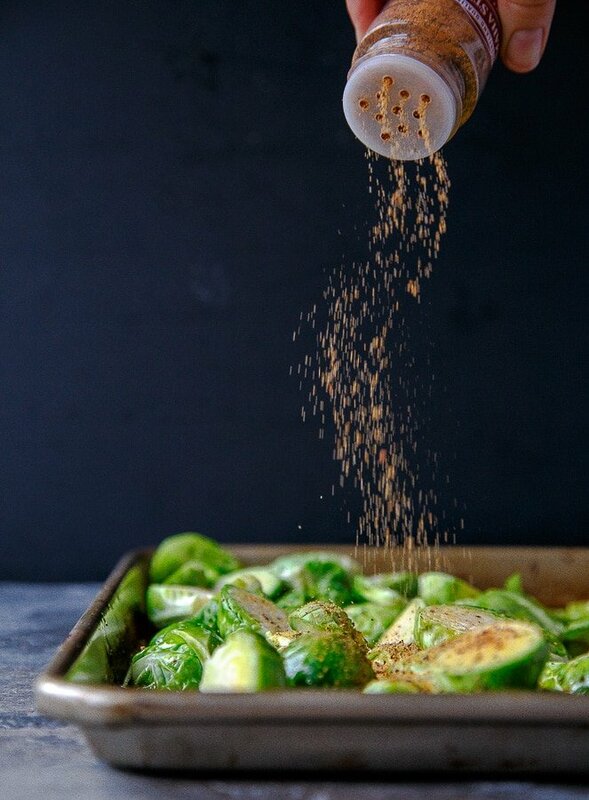 On a half-sheet pan, add the Brussels sprouts, steak seasoning and olive oil. Toss everything with your hands to coat. Roast the sprouts for 13-16 minutes, checking towards the end of the cooking time. 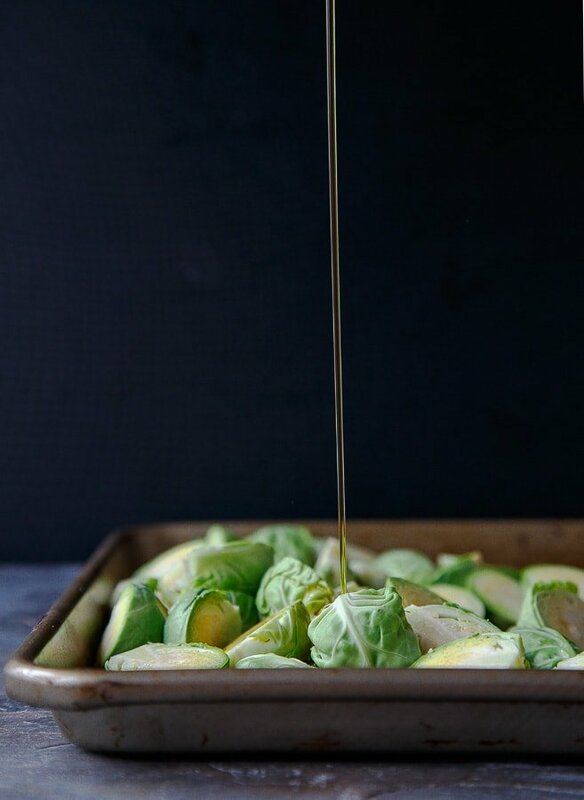 This recipe is fueling my brussels-sprout obsession! Delicious!! Agreed! I love the way you prepared them as well. That steak is calling my name as well. Rest up now girl! Also I sadly agree that my poor Weezer gets the shaft since Andy was born. Especially during the winter because it is so cold I don’t want to walk him and bundle Andy up for a walk either. He has adjusted though so don’t worry the boys will be fine! I looooove that seasoning picture! Beautiful! Welcome home! I hope you squeeze some well deserved relaxation and snuggle time in as often as you can. And please bring on ALL THE COMFORT FOOD. It’s negative 10 here today. HALP. I cannot WAIT for your checking in post this weekend. Been stalking the Instagram and am so excited to hear all about your trip! Meanwhile, I could totally sit down with a big ol’ plate of steak and sprouts right now. That oil drizzle shot? Stunning!! This looks like the meal for me. Love roasted brussels and is my favorite way t cook most vegetables. Cannot wait to get ahold of your cookbook! It should be arriving sometime this week if the weather hasn’t totally sidetracked it. Nooooo I can’t imagine paying less attention to my dog once a baby comes along!! I don’t want to even think about it. (As he sits here and stares at me like he knows what I’m talking about). That steak — perfectly cooked. The brussels sprouts — perfectly caramelized. What a perfect meal. Roasted Brussels sprouts are THE BEST!! And now I want some. At 10:23 in the morning. Keep those dinner’s for two coming!! Your charred corn tilapia is in my regular rotation! Something new with chicken would be fun. I have gone full circle from dogs to kids and back to dogs now that kids have flown the coop. Emily, you aren’t late… I was late. I was over 33 before I started cooking any “real food” (though I do still believe chocolate cake is real food because it contains all food groups: dairy, grains, protein & fruits/veggies — if you put a strawberry on top!). My 1st piece of advice: go slow and easy with basic main courses, and go for prepared sides (frozen veggies, readymade salad). Once you’ve mastered the mains, and then modify them with different spices, sauces, glazes. Soon the “hard” main dishes are easy and allow you time to concentrate on all the other parts of the meals. 2nd advice: push yourself at least once every couple months. Make something you’ve always thought was hard. If it turns out, Great! If not, at least you tried. And just so you know, it is possible to start late and still succeed. In less than 5 years after starting to cook, I pulled off Thanksgiving dinner with 7 side dishes and dessert and they all came together at the same time, ON TIME! Yeah, tooting my own horn a little, but I was dang proud of that! Krista, you have given me hope and assured me that I’m on track!! I’m working on the mains (like a yummy chicken that’s flavorful and moist) while leaning on things like frozen green beans or zoodles. Sometimes it’s great; sometimes it’s not. I’ve read in both Kitchen Counter Cooking School and Dinner: A Love Story that cooking isn’t something that a lot of people are magically good at. However, lots of folks are trying to feed kids, and when you have to try to put food on the table every night, your comfort with cooking increases. You start to trust yourself more. I think that fear of failure in the kitchen is sometimes (heck, OFTEN!) paralyzing. The point is: KEEP TRYING! So who says you can’t cook? Not every meal has to be made from scratch, nor does everything you consume have to be organic, locally sourced, and pasture raised. Try to find a comfortable place somewhere between Tuna helper and Top Chef. If you burn, scorch, drop, overcook, undercook, underseason or otherwise put a meal together that’s less than a success, in the end it doesn’t matter. It’s just one meal. You’ll make another one tomorrow. In a hundred years, no one will know the difference. Thanks for the confidence, Krista, that there is hope! And KUDOS to you for your roaring successes!! 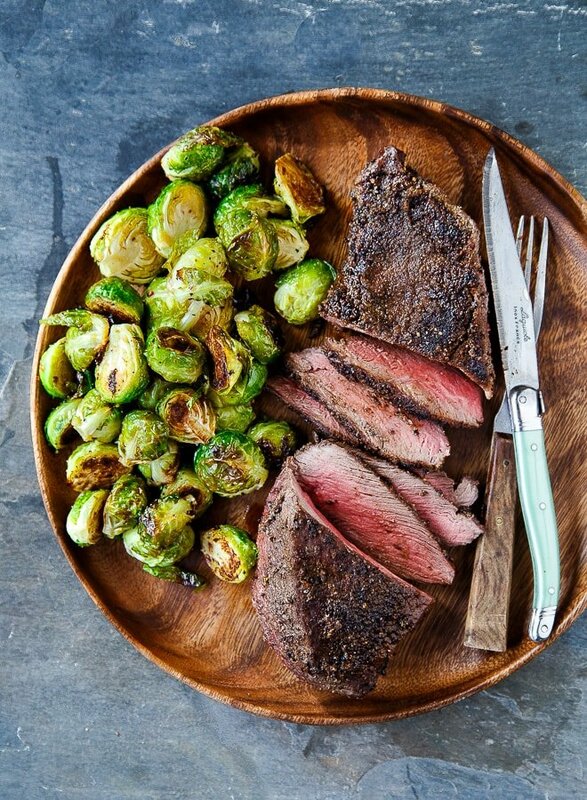 this steak looks absolutely delicious and those sprouts….gah! love them! ps – medium rare steak on the rarer side forever!!! Hey girl-congratulations!! Is it a boy or a girl? So exciting! I just can’t wait to have a baby in the near future. Oh the steak and brussel sprouts looks so yummy!! What about rice and pasta dishes for two? any thoughts? Take care and rest I’ll be praying for you!! Could you kindly qualify the cut of meat of a London Broil? It looks a good deal different, by the pic, than the London Broils that I am used to seeing. By the pic, it almost looks like a loin cut. Is that right? I think my husband would propose all over again if I made this for dinner. These pictures……..WOW. Like, jaw on the floor. Total gorg! This looks AMAZING! your pictures are gorgeous! always love a good steak! I just found this recipe on Pinterest and decided to give it a try. It ended up being an amazing dinner! The flavors were amazing for both the steak and brussel sprouts and the two complimented each other so well. I was a bit worried about using coffe grounds in the steak rub but felt adventerous and am glad I did! I will def be making this for dinner again soon! Thanks for the recipe! Coffee grounds are what you have after you’ve brewed coffee so I assume you mean fresh ground coffee.